Happy Monday! I've been hearing from so many people who say their local Kohl's store is carrying some different makeup brands like The Balm and LORAC! I've seen pics showing that it's not just a few products, but actually the ENTIRE line of makeup from these brands! After checking my store, I've realized that it is carrying some new beauty stuff, but not exactly what I was expecting. 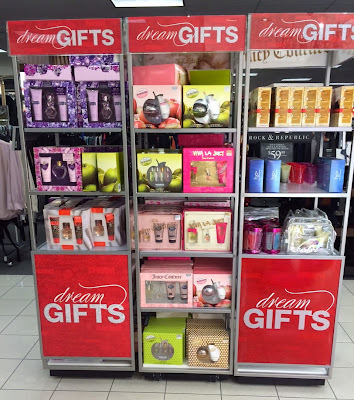 First off- as you can see from the picture above, there were tons of fragrance gift sets (both men's & women's). As for the rest- here's a look! (And you can click on these pictures to enlarge them). 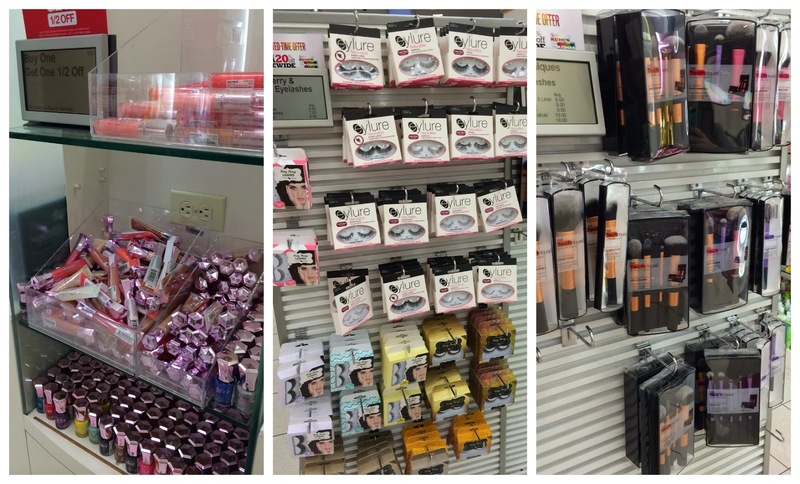 There was a little area near the jewelry with some Candies beauty products- including lip glosses and nail polishes. Also- Eylure false lashes! Including regular varieties, as well as the Katy Perry lashes and some special blinged-out Katy Perry lashes. And... Real Techniques! Both brush sets and individual brushes. How cool! As far as my little haul- I did pick up one of the Real Techniques brushes- it's the 2 in 1 Folding Kabuki Brush ($10). It's a full, very soft angled kabuki, but when you undo the magnet that holds the brush together, you get a skinner and wider brush- which I think could be nice for contouring. Only problem- it doesn't seem to actually lock in place when you open up the brush... you just have to hold it that way. Also- Christmas stuff is out in the home section, and a lot of the fall stuff is already half off! So I got this little duo of Pumpkin Pie candles from Chesapeake Bay... they're really cute little holders with small candles inside, surrounded by decorative rings. They were $9.99, and I got them for my mom. She's hosting Thanksgiving so I thought these would be perfect to add to the dinner or dessert table! Also- while I like burning candles, I also love the flameless versions! 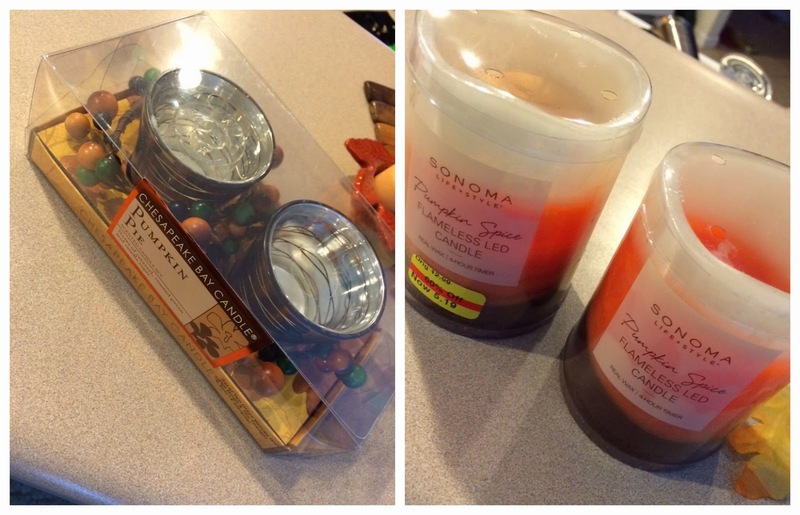 These Pumpkin Spice candles from Sonoma were around $5 each. I've been wanting to pick up a new blanket for the couch, and I thought this one would look great on the brown leather... yep, it's zebra print folks! It's SO SOFT. Had to even snap a blanket selfie. This was $20, which I kind of thought was a bit much... but as I said- it's just as soft as can be and is a nice size- 5ft x 6ft. It's not super heavy and thick, but just enough weight to keep you warm. Cupcake will love this too. Had a nice Sunday night... crock pot chicken & dumplings and Hangover 3- LOL! Hangover 3 was ok, but not near as good as the first one, in my opinion. Aziz Ansari is on Katie now. He kills me!! So funny. Making some of those two ingredient pumpkin cupcakes to send with Tyler to his office (technically more than 2 ingredients if you frost them). These could not be easier. You cannot miss! Holiday palette review coming very soon to Beauty Broadcast Express! What lip product are you wearing in your selfie? It is SO pretty! I have never ventured to check out the beauty stuff at Kohls, now I definitely will! I bought that same blanket (in black) from Kohls last Christmas.....it is a family fave...we fight over it! It is still super soft after many washes. 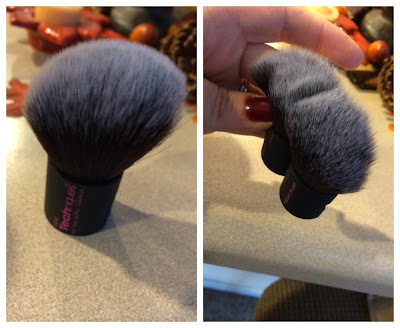 Are the prices on the real techniques brushes cheaper than they cost at ulta by any chance? I bought a LORAC palette over the weekend at Kohls. Very nice colors. When I got home I googled the name of the palette and it was from Christmas 2012. So, if that matters to anyone you might want to check the products. I never go to Kohl's, now I need to! I love Blankets! My cats have blankets all over our house, and they will not sit on us until we put a blanket on us...spoiled?? NO!!! 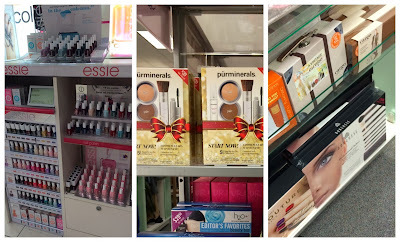 I also got all jazzed when I found out about Kohl's stocking theBalm, especially since they're not at Sephora anymore. On kohls.com they have 2 awesome gift sets--1 with Mary and Betty Loumanizer, and 1 with 3 Instain blushes--for a great price. Ah, that's cool that Kohl's is stocking the Balm and Lorac .. the Simply Vera eye shadows are crappy (and that's painful to say because I love her clothing line!). The American Beauty lip glosses are nice though, but nothing unique or spectacular. You can also check Kohls website to see if the Balm and Lorac are at your Kohls in your area. I live outside of Austin. So make sure if you are gonna go to your local store that they actually have what you are looking for. interesting- can't find a section of the site that specifically tells me what my local store carries. If you ever decide to purchase Hourglass's ambient lighting powder this particular Real Techniques kabuki brush is PERFECT for it. Hourglass has their own version of a flat brush but it is expensive, so the RT is a very good, cheaper alternative. I definitely noticed that my Kohl's was carrying more beauty brands but I didn't see the Balm there either... here's hoping it comes soon! Thanks for the heads up! I saw Real Techniques at Walmart too, which I thought was odd! Are they generally good brushes? 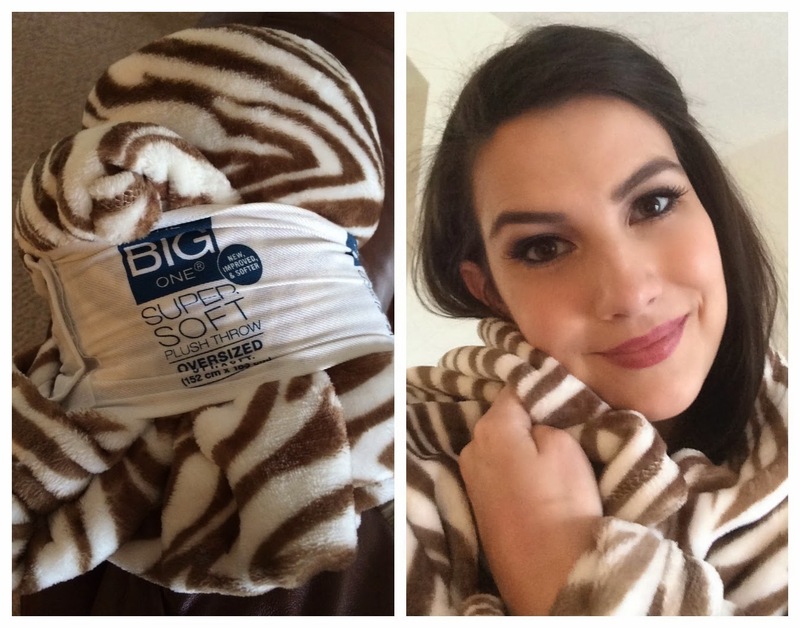 Love the blanket, I have one in tan zebra from a Florida store Bealls so soft and cozy. My daughter has claimed it for her bed. Do you know which LORAC sets were there? 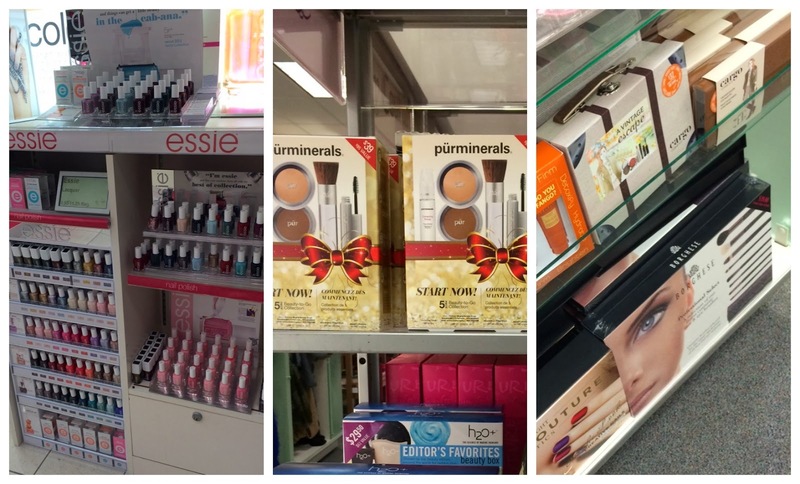 I have a Kohl's very close to me and I wasn't even aware that they carried makeup of that quality! (I don't really shop there much.) With the holiday gift sets coming out I'm wondering what they'll have in stock!? I did get one of tarte's "Gorgeous Getaways" Holiday Gift set. (I also picked up the 8 piece lipsurgence gift set from Sephora a while ago. I did an entire blog post reviewing the tarte "Gorgous Getaways" set. blog.reneebruch.com if anyone would like to check it out! :) You are by far my fave YouTuber. You give such great info and I tend to mention your channel in my blogs alot because I "steal" looks and some tricks from you all the time. Gotta give credit where credit is due I say! Keep up the great work. Loving all 3 of your channels! I just discovered my Khols is carrying the ENTIRE line of The Balm! I literally almost fell on the floor and died! I picked up an Instain trio and a set of Mary Loumanizer and the Betty bronzer for awesome prices!! I've never been able to see/touch/feel The Balm in person before so I was just so over joyed! Add a bag of chocolate chips to the pumpkin cupcakes - then you don't need to frost! I freeze mine so hubby and i only get out one at a time!! Dang it!! I need to get to Kohl's ASAP!! Just wanted to let you know that the Cargo Vintage Escapes eyeshadow palette you have pictured in the 3rd picture, far right, is AMAZING! I got it when ULTA was doing a special for $20 (regular price is $39), but the quality of the shadows blew me away...I had been wanting the Stila In the Light palette for so long before I got this, and now I'm happy I didn't! I checked the Kohls near me today (Wausau, Wi) and they have everything! I'm super excited about The Balm items since I can only buy those items online. The Lorac makeup isn't any cheaper than Ulta prices though. Either way, it's pretty neat that they have gotten more variety in there! Long time watcher, first time commenter here. The greatest part is the return policy - if you hate it, even if you use it a bunch, return it! No questions asked, no time limit. You will certainly discover all the details regarding Official Website Present card will certainly available for acquisition $15, $20 $25, $50, and also $100 bucks. It's nice to see the post! Thank you so much!